The papillon ("butterfly") and the phalene ("moth") is basically the same dog, only the ear carriage is different. The papillons ears are carried upright in a degree of 45° like the wings of a butterfly, whereas the ears of the phalene are dropped. In both cases, though, the ears should be vividly mobile. It is possible to transfer a papillon to phalene pedigree and vice versa, this can take place on an official show after 9 months of age. Crossmating between the two breeds are in fact allowed but not recommended, as it would then be difficult to predict which variety the progeny would be. Papillon and phalenes are happy dogs, lively but at the same time willing to learn. They are faithful to their family, but should also be confident and outgoing, and never shy. The coat has a lot qualities: Silky, easy to maintain, does not smell, requires only an easy grooming to be held in condition. Due to this fact a pet dog may appear just as glamorous as a top-condition show dog. But you must be prepared for a bit of shedding at times. According to the breed standard the size is between 1.5 kg and 5 kg, quite a difference, and these two ends will of course represent quite different types of dog. For a home with children the dog should not be too small. But also the small specimens can live a fully natural dogs life with walks, training etc. Papillons and phalenes will normally stay healthy and in good constitution for many years, and they often live for 13-14 years or more. Testing for PRA was mandatory for breeding stock from 1997 to 2011 where it was estimated that PRA is no longer a major problem in the breed. However, a DNA test is now available and by testing all dogs before breeding, it can be secured that no puppies are born withs PRA1. Serious breeders will continue to screen for other eye diseases. Patella luxation can be found in the breed, but fortunately it is rare in Denmark. A combat programme since the early 80s consisting of examining stock on a voluntary basis and only breeding from sound dogs has reduced the number of cases of patella luxation in Denmark. Serious breeders test their dogs prior to start breeding them and do of course not breed dogs with patella luxation. The Danish Kennel Club's database with documentation of health testings, the Hundeweb, is open for members. If interested in a specific line it may be a good idea to require information about the ancestors' health testings. 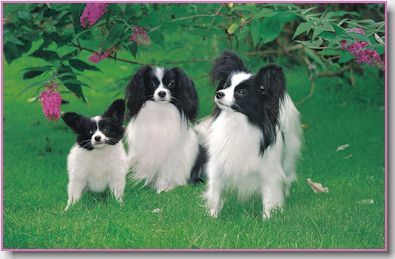 When acquiring a papillon or phalene in Denmark, whether it be a pet or a show dog, always make sure that the breeder is associated with the Danish Kennel Club (Dansk Kennel Klub), associated under FCI (Federation Cynologique Internationale).